1. Suitable for mixing and blending granular or powder materials. 2. Suitable for pre-mixing or after-mixing of extruding and injection operation. 3. Suitable for mixing and blending the foodstuff or the farinose chemical. 4. 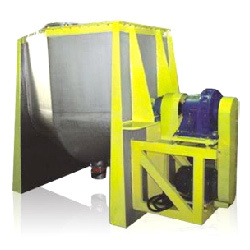 Range of mixing blending weight: 50~1500kgs (custom weight is available). 1. Capacity: 600 ltters. 2. Mixing weight: 300 kgs. 3. Motor: 7.5HP + reducer. 4. Machine dimensions (L x W x H): 2150 mm x 950 mm x 1650 mm.